tech-logg: Books And What To Do With Them! Books And What To Do With Them! Like most people, we've accumulated a fair number of books over the years and, being at a loose end for a few weeks recently while my broken elbow mended, I got to wondering what could be done with them in a technological sort of way, other than buying more of them that is. The most obvious answer is to investigate e-books but I don't think the technology is there for that yet. Sure, there are loads of e-books out there and loads of them are freely available but I simply don't think very many of us would be happy reading an entire book on a computer or PDA screen. Unless you're trying to learn something, reading is a leisure activity best done in a relaxing setting so until we can get a slim, paperback-sized, low-priced, portable reader with a screen that adjusts for ambient light, I don't think e-books will achieve any great impetus. Electronic paper seems the way to go for the hardware but there are precious few products available as yet and none of them cheap. Amazon's Kindle has just appeared on the US scene but at almost $400, it'll take some serious marketing or a large price drop to make any inroads into the casual reader market. I know, making lists of stuff is sad but we've got hundreds of books piling up and it would be useful to know exactly what we've got as it wouldn't be the first time I've bought a book, only to find out that I already had a copy. 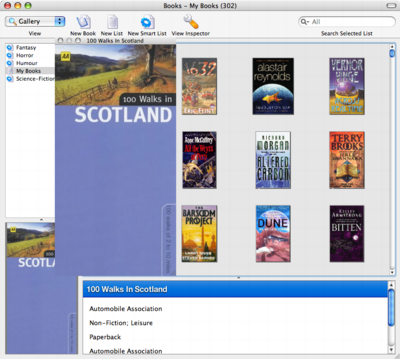 So, being a fan of Macs and free software, I've been trying out Books, a free, open-source book cataloguing application for Mac OS X. Books is fairly simple: it lets you catalogue your books into a search-able database and you can easily add books manually, by quick look up on Amazon (by title, author or ISBN), by scanning the ISBN if you have a camera attached or by importing from tab-delimited text file or various other book application formats. Once you've got some data in there, you can add it into the Spotlight index so you can search for a book without having to open the application first. I quite like Books and, while adding books by letting it fill the data in from Amazon fills in a lot of useful data, the Genres field ends up with useless subject data and the book cover can be missing on older books. That said, it's easy enough to clear the genre and enter something useful and I've managed to find most of the missing book covers with a bit of searching the net. The export facilities are also pretty useful You can export the book covers to iPhoto, the booklist to your iPod or a tab-delimited text file and the database to PDF or even a web site. Importing and exporting is done via plug-ins so it's a very flexible system. I really liked the idea of being able to export the book list to an iPod or PDA as it'd be handy to be able to check if I already had a book before buying it. You can also keep track of reviews, multiple copies and lending history as well. On the Windows front, there's Libra, which is free for non-commercial use and can catalogue audio CDs, movies, & games as well as books. Hook up a webcam, and Libra can use it as a barcode scanner too. You can also use it to track items you've loaned as it'll let you keep a detailed record of each loan and remind you when it's due back. Printing looks pretty good as well and you export your library to web pages, and upload them to a web host to share with friends & family. 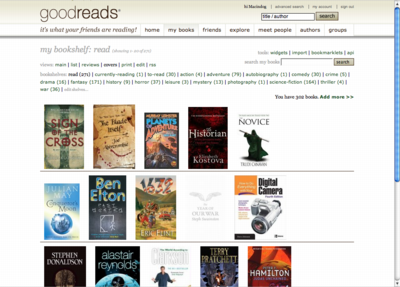 The next step up was to an online cataloguing system and I ended using Goodreads as it was free and very easy to use. There are quite a few others out there, LibraryThing being probably the largest and most-established but it's only free for the first 200 books. BookBumps is another free, web-based service and it's fairly new but presents a more iTunes-like interface to manage your library. Then there's sites like Listal and Listphile, which are really more comprehensive online listing engines anot designed specifically for books alone. You can also build collections in Amazon wish-lists or in Google Book Search but they are far from ideal. Goodreads is really nice to use. You can add books manually or by searching for it in Goodreads or any of the various Amazon databases by title, author or ISBN. You can also optionally add a rating, a review, the date you read the book, if you have a copy to sell or swap, and which shelves (categories/genres) to put it on. You can also flag the book you're currently reading and those you have still to read, which is useful as I seem to have over 20 still to be read and I've still a load to go through and add. Members may also be granted librarian status and those can edit the book database to correct errors, add cover images and combine editions, etc. You have to ask for the privilege and I managed to get it so have done a bit of tidying up and correcting as I've been adding. Combining editions is useful for the whole community as it aggregates reviews and statistics into one place. Goodreads also promotes a social aspect to reading in that you choose to let others see your book collection and profile. You can also add friends by using your Yahoo!, Hotmail, or Gmail address books to invite friends and see which friends are already Goodreads members. You can invite them by e-mail or just search the site to see if they're already on it. Of course, if you're the unfriendly sort, you can keep your profile and bookshelves private. You could always turn to selling or swapping your books once you've read them. I had a look at selling books on Amazon and ebay a while ago and, while it's easy to do it, it's just not very profitable as postage charges are quite high for books. I've sold loads of DVDs through Amazon as they're relatively cheap to post and hold their price for a while but secondhand books just don't command a very good resale price and there are loads of them listed for 0.01p. The only way to make any money selling at that level is to skimp on the postage but even that's difficult as they are usually classed as packets rather than letters. In my opinion, it's just not worth the bother of time spent packaging and posting. I'm tempted by the swapping angle as there are a few sites out there promoting the free swapping of books. The only costs are the postage but I think the benefits outweigh even those. The best site I can see for this with a decent number of books listed and reasonable UK presence is BookMooch, which is run by John Buckman, who also designed and wrote Lyris ListManager, a well-respected commercial list server suite. What you do is publish a list of titles you'd be willing to swap and, for each one listed, you get 0.1 points. Requesting a book costs 1 point (2 if it's not from your own country) and each book you send gets you 1 point (3 if you have to post it overseas). All of that means that you need to list at least 10 books to be able to start the ball rolling. You even get 0.1 point for acknowledging receipt of a mooched book. If you want a particular book, then you add it to your wishlist and the system automatically sends out requests to matching bookholders if you have enough points to cover the transaction. Like other social sites, users can leave feedback on book senders so the better your feedback, the more likely you are to receive your books of choice. If you amass a surplus of points, then you can donate them to charity so they can benefit from getting free books too, although they only list US based ones at the moment. I'm not entirely sure if the economics are sound as you may well be cheaper just buying second-hand books from ebay or Amazon, etc. but you'll still end up with a house full of books and won't have that warm-hearted feeling of having given something away and made someone else happy. I think I'll give it a try and see how it goes. I've got a box full of books I no longer want so maybe someone else will. This one's a strange concept! Basically you leave (release) your unwanted book in a public place. Leave it on a park bench, at a coffee shop or at a hotel on vacation. Share it with a friend or tuck it onto a bookshelf at the gym -- anywhere it might find a new reader! With over 600,000 members worldwide, the BookCrossing web site proves that this isn't a passing fad and some take it fairly seriously. Once a book is released, the member logs the details on the web site so others can track it down. Your also encouraged to label the book as being a BookCrossing release to try and increase the membership and so pass the book on once it's been read again. Of course, they'll sell you some very fancy sticky labels to do just that and they're not cheap either but that's clubs for you. That only leaves giving them away to charity, jumble sales or burning them but the society envisaged in Ray Bradbury's Fahrenheit 451 isn't with us yet, thank goodness.